The Low Pressure Area in the Southeast Eastern Samar is now developed into a Tropical Depression, according to weather forecast of PAGASA on Friday, January 17, 2014. PAGASA stated that "the Low Pressure Area (LPA) was estimated based on all available data at 250 km Southeast of Guiuan, Eastern Samar. The Northeast Monsoon affecting Luzon." 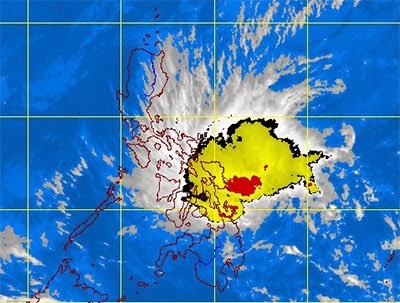 PAGASA locally codenamed the Tropical Depression as 'Agaton,' first cyclone for this year that entered the Philippine Area of Responsibility (PAR). PAGASA raised public storm warning signal no 1 in the following areas. PAGASA added that Bagyong "AGATON" will bring moderate to occasionally heavy rains and thunderstorms over Eastern and Central Visayas. For the meantime, If you feel that this story are informative, please bookmark it now or visit this site more often for you to be updated. You may also share this post to your friends so they may know about Bagyong Agaton 2014. Comments or suggestions about "Tropical Depression Agaton on January 17, 2014 Update" is important to us, you may share it by using the comment box below.